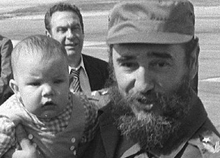 Fidel Castro's Stepson Seizes Control Of Canada! As comedians across the land rejoice that Justin being PM writes its own material, others know that darkness has fallen over Canada. Right now the Liberal motorcade is arriving in Ottawa and Justin is getting out, having vowed to complete the final leg of the journey coasting on his roller-wheeled shoes. To me he will be known as Prime Minister Fluffhead or possibly just, 'Fluff,' for short. The Liberal spending spree, pro-ISIS, marijuana party has begun! SOS: Civilized people of the world come to our aid, not with declarations, but with force: A Fluffhead has seized control of Canada!